Children build their self-esteem through experiences. When you play with your little one and allow her to be herself, you are nurturing her confidence. Keep reading to find a step-by-step guide for helping your bundle of joy develop her self-worth. When your baby is born you are the most fascinating thing in the world for her! That’s why she looks at you in such a miraculous and admiring way. Since she is born, your baby starts appreciating what you give her. She appreciates the warmth of your touch, the light in the hallway because she knows mommy is on her way, etc. Your baby is born into the world feeling appreciative. So, to make her feel appreciated, you must first pay close attention to her. Turn your expectations into appreciations and acknowledge the reality of who she is. What does she enjoy? How is she like? Allowing your little one to find what truly interests her, rather than what everyone else likes, is part of building her own identity. If your child is playing in the sandbox alone it doesn’t mean she is lonely or has low self-esteem; find out what she is doing that intrigues her so much. Pay attention to her feelings and try to understand what your little one means —positioning yourself in her little shoes. Observe and ask yourself what she might be feeling when you say or do something. Appreciate her feelings, recognize the legitimacy of what she wants, and let her know you know that. When your little one feels understood she feels accepted and loved. Being a good role model doesn’t mean having to smile all day. Instead teach your little one about effort too. How sometimes we don’t feel like doing a chore, but when we do things in a cheerful manner or at least without complaining and putting our effort into them, we can take pride in a job well done. This is modeling her confidence and persistence. Find bonding times and let her show and tell you who she is. What does she want to do? Maybe she doesn’t enjoy soccer, but likes to play with building blocks, or maybe she prefers puzzles over stuffed animals. Why is that? Of course praise your child throughout an activity, but don’t overpraise. Your little one is quite skilled in reading your facial expressions and tone of voice. So, sometimes is better to give her a vote of confidence and praise the effort saying: “It’s okay, everybody has off days, tomorrow will be better”, “I’m proud of you for not giving up!” or “You are getting better and better at this game!”. Begin to get to know each other in that context of love and respect. 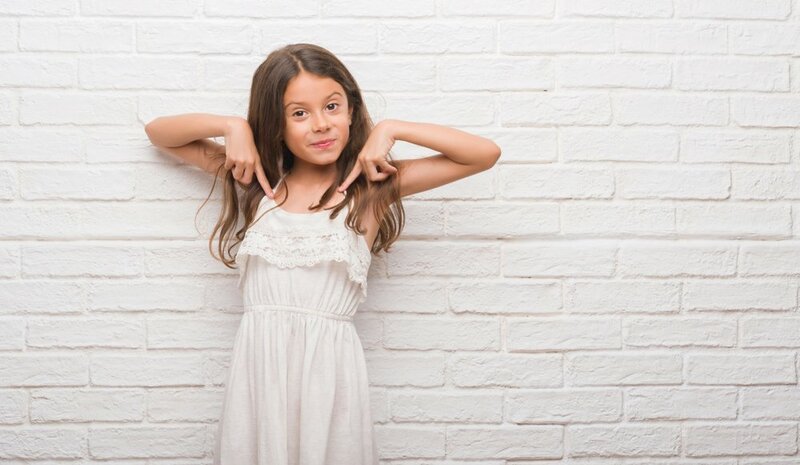 When your child feels she can be herself, she builds confidence in who she is. Nurture times to let your child feel proud about herself. Letting her be the source of her own mastery will build her confidence and self-esteem. Let her explore freely while you set limits in the environment. There’s nothing more fascinating for your child than to get to know new things; from learning how to hold a block to knowing the name of the shapes and colors. She wants to know how things work, so let her figure it out by herself. Don’t skip the challenges where she might get frustrated or scared. There will be situations where you will want to fulfill her needs right away, but try showing her the way and letting her be the protagonist of the story. For example, if your little one is at that stage where she wants to crawl everywhere and she seems to find herself under a table and doesn’t know how to get out, instead of taking her out yourself, show her how: “It’s okay, just lower your head and come to me, like this”. She will come out of that table with a smile from ear to ear, feeling competent and not afraid of getting in those types of situations again. Comforting her and helping her find her own way allows her to tune in to people, tolerate frustration, and manage emotions and impulses. These are opportunities where your child is figuring stuff out on her own and building her sense of competence and self-worth. This is what your little one is going to need later on to be able to get through the sad, scary parts of life as well. Keep helping your little one build her self-esteem and express herself! Get Speechy This Fall with These Activities!